About a week ago I broke down and picked up a used Quasimidi Rave-O-Lution 309 that literally had been sitting on the same shelf in the same location for almost TWO YEARS! The 309 would just not sell at this particular used music shop I frequent. So last week I finally sat down and gave it a test drive at the shop and found it to be surprisingly quite good and fun. I asked the clerk if he had anybody interested in it and he said it was a very tough sell. The price was a tiny bit high which perhaps might have been the problem, but as a result of showing interest, he knocked the price down considerably to the point that I just couldn’t refuse. What I found out later after bringing it home was a bonus!! Upon further research and inspection of the Rave-O-Lution 309, I discovered that the additional audio output section on the back was actually an audio out expansion board. I then opened up the bottom of the unit and found the OS version to be 3.00a. What excited me the most was to see both expansion slots filled!! My goodness, the Synth Expansion and Drums & Percussion Expansion boards where there. Thus I soon discovered that I had purchased a fully loaded Quasimidi Rave-O-Lution 309. It even came with the original Quasimidi adapter. No wonder the price was a tad bit high to the casual observer. The original sales clerk who is now long gone probably did some research and priced the unit appropriately at the time. 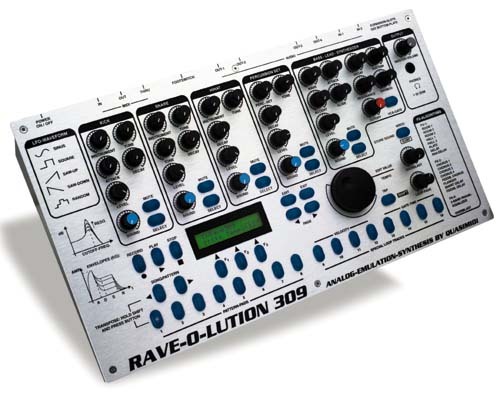 Unless you were “informed” about the Quasimidi Rave-O-Lution 309, you would never know there were expansions available. After playing the Quasimidi Rave-O-Lution 309 for a while I soon discovered that this box really rocks loud!! There is a booster on it and when you dial it up a few notches, the drums really kick which is really great. I also found the on board sequencer to be super simple to program and create pattern loops. There is a MASSIVE glitch in the playback however after you finish a sequenced recording which is famously pointed out all over the internet. I’m afraid that likely will never go away since the product and company are pretty much discontinued. Thus you couldn’t really use the Quasimidi Rave-O-Lution 309 has a live looping drum machine, but that doesn’t matter really. You can create regular pattern sequences really fast and quite easily. Plus the multitude of knobs and ways to edit the sounds and grooves are fantastic. Here are two VERY IMPORTANT links I found on the web that are required reading and downloading for the Quasimidi Rave-O-Lution 309. They are not that easy to find. Finally, here is a decent link of the Quasimidi Rave-O-Lution 309 in action aptly titled “Acid 309” by Ricky Zeta. Last weekend I picked up a really nice used drum machine called the Kawai R50 III. There is a standard R50 version and then another “e” version which had electronic drum sounds similar to Simmons drums. I had never seen an R50 version III ( Version 3 ) before but likely it means that the sample sound chip inside has just been replaced with either a newer or different one. I heard the “e” version was simply a swap in sound chips. The sound of the Kawai R50 III is actually very good, especially if you are going for that 80’s or early 90’s New Jack Swing sound. The samples are a bit Lo-Fi which I like very much and the R50 is pretty easy to program. There is not a whole lot of info around the internet about the Kawai R50 although I do know that circuit benders like the drum machine for some reason or another. I bought it in excellent condition for $10 and thought for the price it was a fantastic little machine. It’s kind of cool pairing it up with my Kawai K4. If I find any further information about what the version 3 means I’ll post it here in a follow-up. Perhaps it was only released in Japan. Stay tuned! Here is a Youtube video of the presets found on the standard Kawai R50. Today I was going through some used music gear at a nearby second hand shop in downtown Nagano-city, Japan. On a shelf I discovered three Yamaha RY-20 drum machines. One was for $150 and the other two were $10 each and labeled as broken. I took the two that were broken and tested them at the shop and sure enough they operated just fine with one exception. When you pressed play on either one, the patterns would not play. I scratched my head a bit and was wondering why both machines had the same problem….strange! I figured I would gamble a bit and decided to buy both Yamaha RY-20 drum machines mainly because they sounded AWESOME!! I mean, the RY-20 is loud and many of the patterns swing really nice, ala New Jack Swing! I couldn’t stop playing with the drum pads which really felt great and the sensitivity was just excellent. If they indeed were broken I could at least use them for sound modules. So, I bought both drum machines and they even came with the adapters. When I got home I decided the first thing to try was a “factory reset”. I looked for a PDF manual online and found the reset procedure. You have to press both the -1 and +1 keys at the same time while powering on the unit. Unbelievable! Both Yamaha RY-20 Drum Machines kicked into high gear and started to work beautifully. I later found out that both machines were in MIDI sync mode and wouldn’t play because they were expecting an external midi command. The guy who sold them to the used music store probably left them in MIDI Sync mode. The sales clerk thought they were broken and dropped the price to $10 each. Amazing!! This evening I spent an hour playing the Korg Poly-61 along with one of the Yamaha RY-20 drum machines and it was a lot of fun. The drum sounds are really nice and you definitely can get that 80’s or 90’s vibe with it. I believe the Yamaha RY-20 was released in 1994 which was a year after I originally moved to Japan. 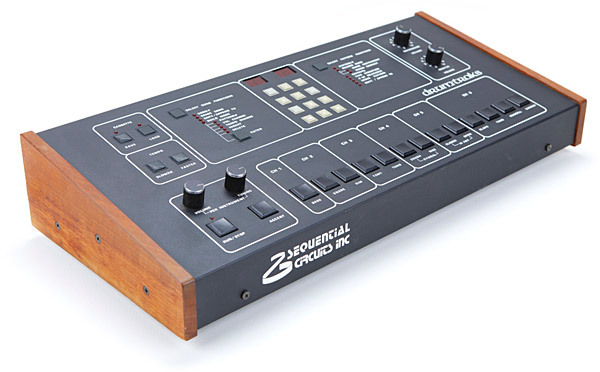 It was quite extraordinary to find the RY-20 drum machines. I can’t believe how great they sound and if I new they were this fun to work with I likely would have bought one earlier. The Yamaha RY-20 drum machines sound much different than the Rolands. I like how loud the RY-20 is and for Synthpop or that New Jack Swing sound it’s just fantastic. There is a special sensitivity or live feel to the drums that sounds much different than most other digital drum machines I’ve heard. I may be stretching it a bit, but sometimes I actually feel like the drums are alive. I’ll have to read more about it, but the Yamaha RY-20 really has a wonderful sound. Stay tuned for future updates as I dive into the machine more.